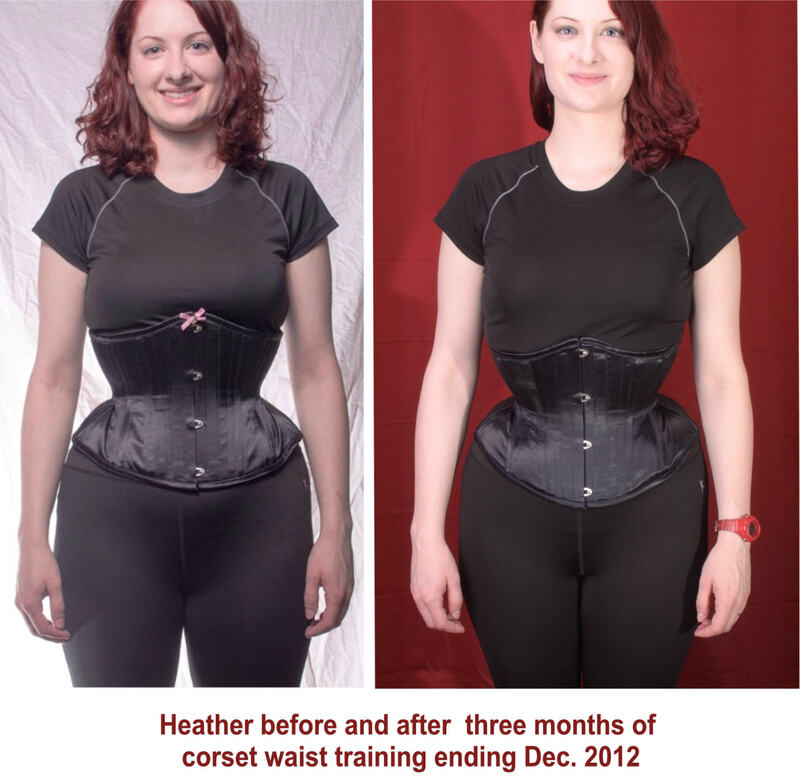 “DOES IT REALLY WORK?” I am no longer surprised to hear this question from email visitors or those who come in person to see me for an appointment to learn about waist training and order a corset. Yesterday I met with a knowledgable, educated young doctor-in-residence in dermatology, who asked if the process “works” — and she asked not once but twice during our chat despite her knowledge of body mechanics and anatomy. She seemed incredulous and remained dubious. 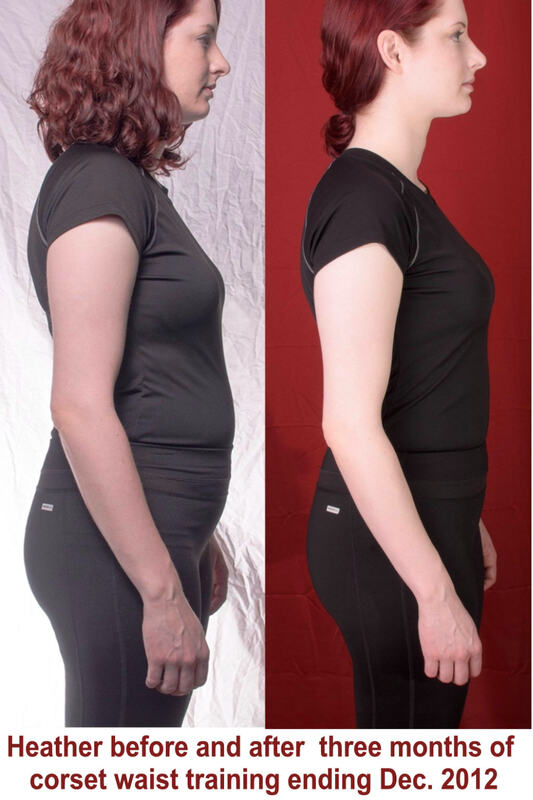 I wish I had had these remarkable photos of my last formal coaching student, Heather, to show my client. I’ve posted the most noteworthy of all “before” and “after” pictures to the left in the side view, and others below. Heather completed her three months of training last December. We had a lot of fun working together during the process! Due to our busy schedules, she just sent her completion “after” photos, and I immediately prepared these comparison images of before and after training, images which stunned us both. I never cease to be amazed at how dedicated effort for only three months, can create remarkable posture improvement as a start, and begin to slowly whittle away pounds if you want them gone, and waistline/figure inches. No you don’t have to lose much weight at all and still can drop waistline inches. The process works “if you work it and go about it with common sense” as I often say. It’s a lot of fashionable fun, even if there are some days you might want out of that corset and off the program when your body rebels. 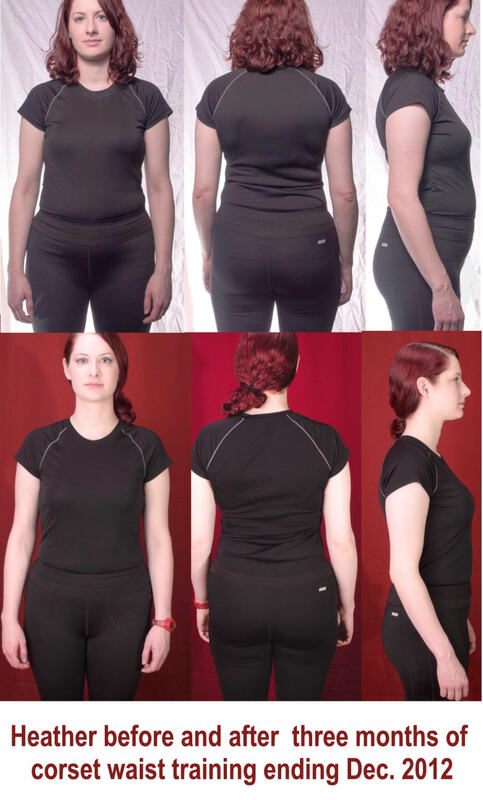 Overall the process provides a positive experience with immediate gratification when you first put the corset on and cinch down the initial 1.5 to 3″ that we normally recommend for most clients. Then with some time and dedication in corset-wearing with gradually lengthening hours of wear before you lace down, waist-targeted exercise, and tummy-friendly nutrition practices and a few critical changes, the underlying figure emerges and temporary reduction turns into permanence. Of course, end the program and then pig out on Krispy Kreme donuts and you know well what will happen. So yes, you have to act like a responsible adult and continue to make responsible nutrition decisions for yourself, plus do some “maintenance” waist training from time to time. 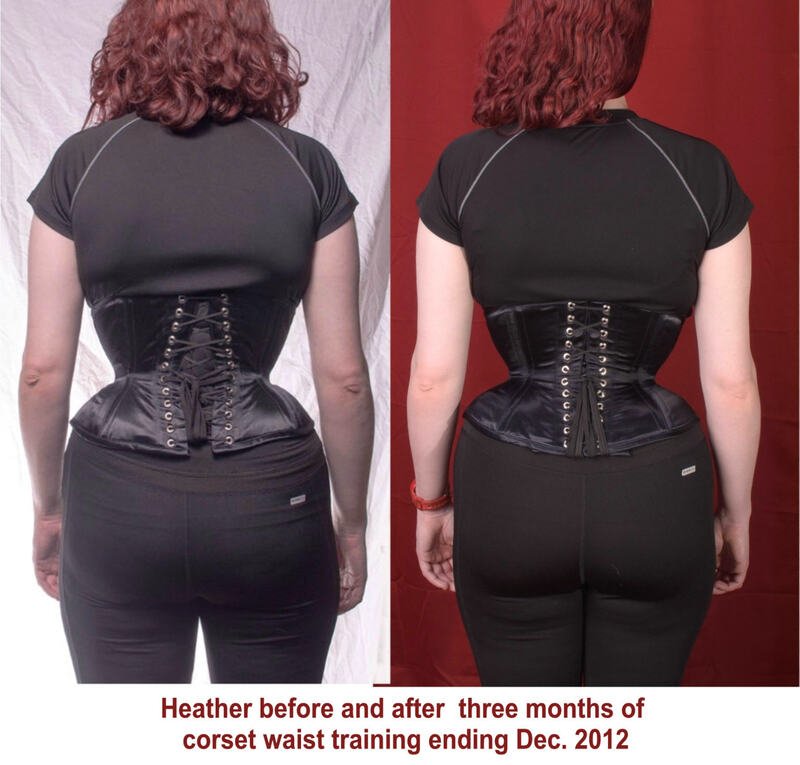 Heather is now planning to implement a maintenance tune-up program once more using the principles outlined in my Corset Magic book and coaching program, to boost her progress forward. We’re looking forward to convincing her to order a glam overbust corset to show off her remarkable figure, as part of our ‘thank you’ for designing our new Corset Magic book cover! She’s a talented graphic and fine artist, and we benefited greatly from her talents as well as her personal inspiration.